December brings with it a whole host of yuletide menus, specifically curated to bring the best of the festive season to your plate. Here are our top picks of where to ‘wine & dine’ this holiday season. For casual, laid-back festivities look no further than award-winning Tr!beca Kitchen & Bar. With both a special set menu for Christmas Eve (including those all important unlimited beverages) and a delicious Christmas Day buffet brunch, this funky, urban-style venue has you Crimbo-covered. The Christmas Eve festive set menu from 7pm-11pm is set to a backdrop of live music and starts at AED 249 for the soft drinks package up to AED 449 for the bubbly. There are even discounts for early elves and group bookings over 6 people. The Christmas Day brunch runs from 12pm-4pm and is priced the same above – expect lots of sparkle and cheer! BOCA’s 2017 festive season offering is an intimate all-inclusive family style menu with an array of sumptuous cold and hot tapas followed by mouth-watering mains served directly to your table. Starting at an outstanding value of 295, these special seasonal menus are actually available now and run through to the 7th January for all those that really LOVE Christmas! Featuring an unlimited drinks package (soft drinks, house beverages and sparkling available) give your holiday season a Latin twist. With a universal merry theme across this luxurious boutique hotel on Dubai’s City Walk, guests can expect traditional Turkey and German Goose served up at both Graze and Chival restaurants (or also available to takeaway) followed by warmed festive beverages at Grapeskin – Christmas covered! Trendy restaurant Graze will be adding turkey to their sumptuous menu with a choice of delicious sides such as potato gratin, Brussel sprouts & beef bacon and roasted baby veg – prices start at AED 450 for two. 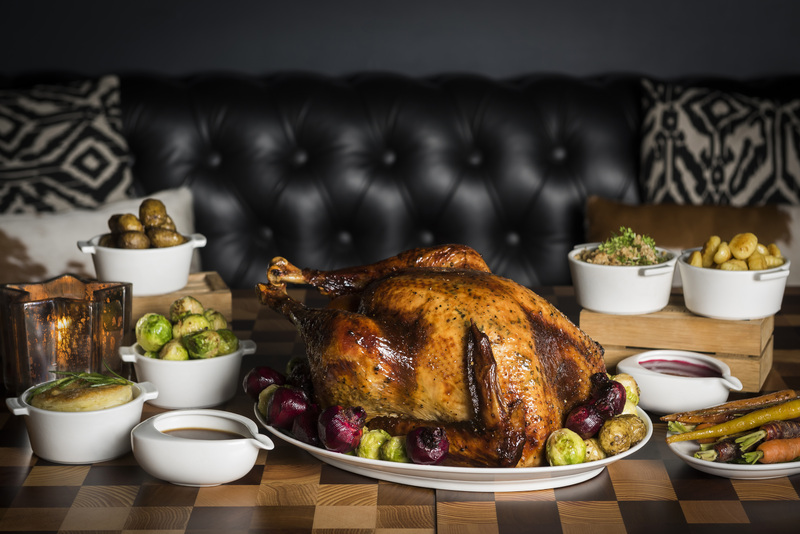 If Goose is more your festive meal of choice then Chival are offering a delicious menu accompanied by potato dumplings, red cabbage, chestnuts and more – also starting at AED 450 for two. From gingerbread houses to live spectacles and festive brunches, Grand Hyatt Dubai has you covered. Our favourite takes place at renowned restaurant, The Collective. With a distinct family focus, little ones will rejoice as they meet with Santa Claus at the Christmas Eve and Christmas Day brunch. Enjoy a delicious multi-cuisine buffet as you celebrate the festive season with friends and family. Starting at AED 250 per person inclusive of soft beverages, AED 350 for sparkling and just AED 125 for children under 12. Visit www.grandhyatt.com for bookings. Puma’s award-winning brunch is back with a seasonal twist this Christmas. Festive inspired dishes and mouth-watering deserts are added the menu alongside signature Zuma favourites. Not just one for glamorous adults, children are also welcome and can enjoy personalised gifts from the big man himself. Starting price of AED 345 for the ‘Kitsu’ brunch including Zuma cleansers and non-alcoholic beverages and ranging up to AED 555 for the ‘Kyasha’ package which includes premium bubbly, Japanese tasters and a selection of grape and hops. Kid’s under the age of 12 can dine for just AED 150. One of the UAE’s best regarded restaurants, the stunning underwater Ossiano is located in Atlantis The Palm, Dubai is offering a specially curated menu for Christmas Eve and Christmas Day. Surrounded by the breathtaking views of The Ambassador Lagoon and its captivating ocean life, guests can indulge in award-winning Chef Gregoire’s eight course ‘Spherification’ menu featuring luxury dishes including Gillardeau oysters, foie gras “terrine”, lobster and black truffle and Chef’s signature dish, the rainbow trout “Floating Island”. The Christmas Eve and Christmas Day set menus are priced at an eye-watering (but worth it) AED 995 per person. For reservations email restaurantreservations@atlantisthepalm.com or call +971 4 426 2626. Expats can enjoy a true taste of home with a British inspired Christmas menu at Gordon Ramsay’s Bread Street Kitchen & Bar. Delight in a selection of the celebrity chef’s signature dishes including the infamous turkey Wellington, the festive menu consists of contemporary British dishes with influences from Europe and beyond. The X’mas Roast Brunch on 25th December starts at 12:30pm and includes a hot and cold starter, several main courses including roast turkey with all the trimmings and traditional deserts including Eton Mess. There is also a live singer during the brunch and little ones get complimentary access to the Lost Chambers. Priced at AED 395 per person including house beverages. For reservations email restaurantreservations@atlantisthepalm.com or call +971 4 426 2626.